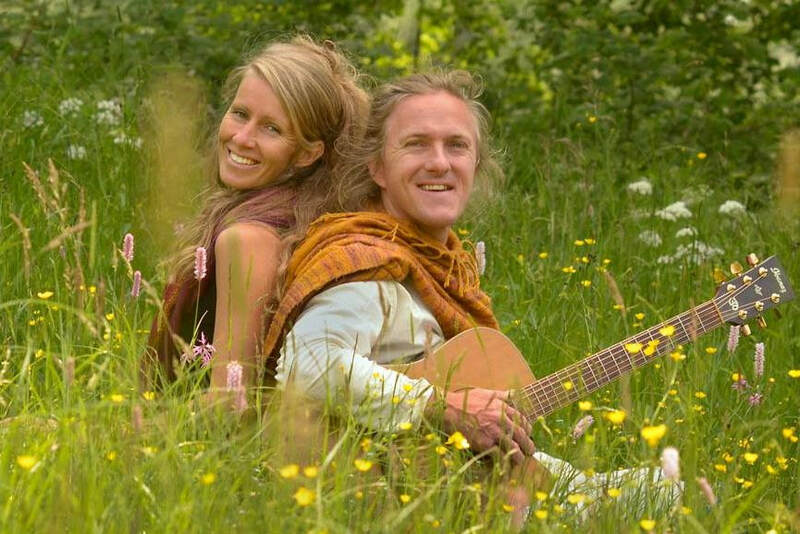 ​In addition to their evening concert, Markus & Angelika of Mirabai Ceiba will also teach a morning of Kunadalini Yoga. Marianela (Costa Rica) began her journey into the healing arts at the tender age of five. 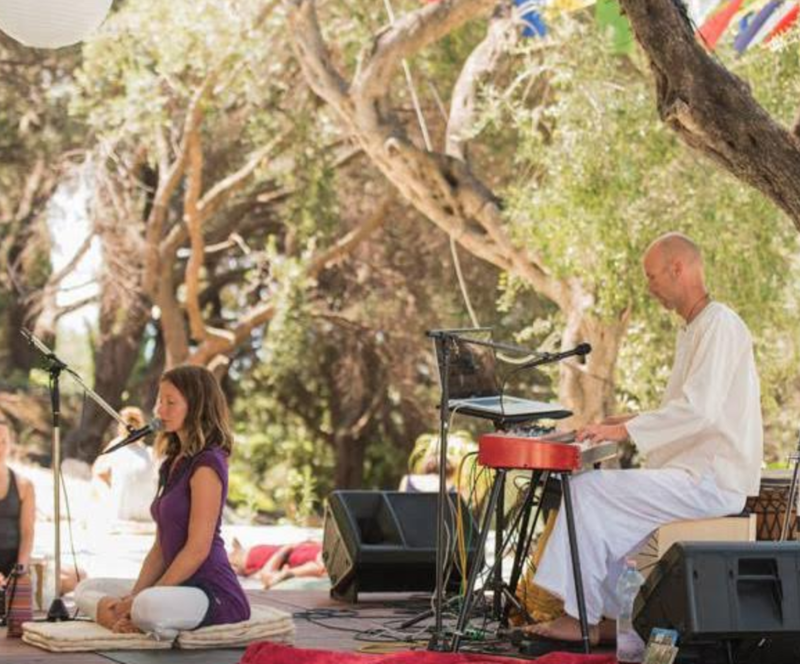 Supported by her spiritual parents, she showed an innate ability for energy balance and yoga, a discipline she later learned at the Baba Hari Dass Ashram in Southern California. Thanks to the teachings of her father, in just a few years she also mastered acupressure. Her skill proved to be so effective and natural that by the age of seven she began working with private clients. At eighteen, she graduated from the Gaia Integral Balance Center as a holistic body therapist, and began her work as an acupuncture instructor to blind students, developing the foundations of a new acupuncture. 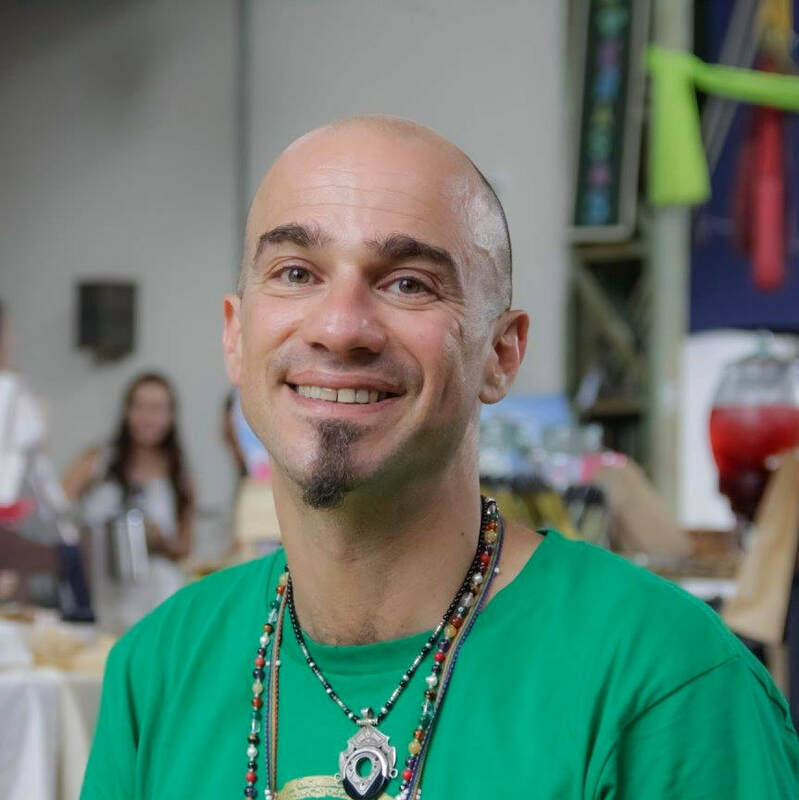 Edgar (Costa Rica) is a physiotherapist, body therapist and yoga instructor with more than 15 years of experience, has offered workshops and seminars on Thai yoga and massage in Costa Rica, Guatemala, California, Canada, India, Thailand, and Cuba with the Cuban Association of Yoga instructors. Graduated as instructor of Integral Balance at the GAIA Institute, physiotherapy at the Santa Paula University and advanced studies in manual therapies at the San Agustin University (Florida, EU). ​Kadri and Laurie (USA & Canada) are delighted to share “Conscious Play and Mindful Connection” - an AcroYoga workshop that will include extraordinary exploration of partnership exercises and group exploits to cultivate trust, compassion and clear communication. Be prepared to unleash your true uniqueness and fully embody your divine potential by embracing heart centered play as a foundation to self-love, true devotion and conscious community. 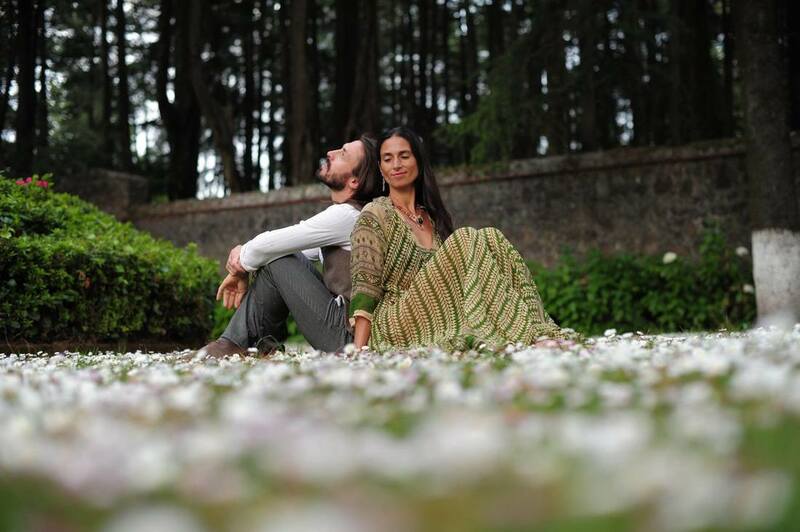 David & Neelam (Germany) are teaching musical Kundalini Yoga. In this workshop you have the opportunity to immerse yourself deeper in the transformative power of Kundalini Yoga. The Kundalini Yoga asanas or exercises are at once dynamic and meditative, invigorating and relaxing, healing and invigorating and feasible for each of us. Use this wonderful opportunity more and more to recognize your true being behind all the conditioning, emotions and colored thoughts, free yourself from built-in limitations and so on to your essence - self transformation is self healing! Janine (Canada)has taught Kripalu Yoga in Costa Rica for 30 years. She loves giving lectures, leading Stressful-to-Soulful workshops, Circles of Women and organizing healing arts lectures, events & journeys. A Way to Increase Your Energy effortlessly as well as your Perception and energy expansion in body movement. Follow the flow of this sequence with 5000 years old proven in its capacity to generate increasing amounts of energy and alignment for the processes of expansion of consciousness. At the beginning of each day and in sunsets Participants can learn a basic sequence of energetic movements that they will use to activate energy when needed in their daily lives, as a tool of well-being. Marcelo works with groups at his healing centers in Argentina. His students learn to utilize vibrational healing instruments and integrate energy activation via Tai Chi Chuan movements. 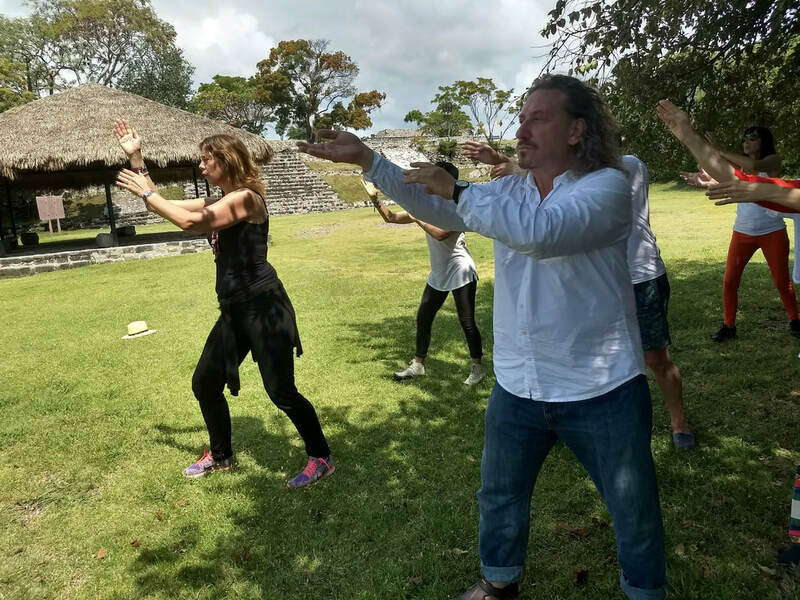 Marcelo has been teaching his unique system for over 30 years, also in Peru, Costa Rica, Mexico, Miami, Denver, Barcelona, New York. ​Kalyani (Brazil) began studying yoga at the age of 11; By 18, she was teaching in many alternative communities in Brazil, and enrolled as a full time student at UNI Yoga School. She has completed 500 hours of advanced course study in classic Hatha yoga, Patanjali yoga sutras, Ayurvedic and Yogic lifestyle in Yoga Vidya Dham school from India. She was initiated into Karma Sanyasa from Swami Satsangananda Saraswati of Bihar school of Yoga. Jesai (USA) has been acting, writing, directing, coaching and sharing the means for effective communication for the majority of his adult life. In his own words: "Stories are the way that humans have transmitted values, culture, history and transformational practices, down through the ages. Whether through dramatic enactment, group chant, simple conversation, or traditional story telling, it is our voices and our deep empathic listening that are our tools. In our time together we will experience a little of the depth in these practices." Vasanti (Canada) embodies Tantra & Eros with a uniquely inspiring spark. She is an Energetic Bodyworker & Medicine Woman, Massage Therapist and Hatha Yoga Teacher. Her path is vibrantly seeking of truth, using Tantra and Sacred Sexuality as avenues of divine exploration. Empowered hundreds of people to restore the peace and luminosity between the Divine Feminine and Divine Masculine. The arts of Sexual Healing, Medicinal Pleasure and Conscious Relating are passion in her life. Infused with the sparkle of active meditation and Tantric teachings, Vasanti inspires self discovery and safely guides people through re-claiming their natural, mystical nature. 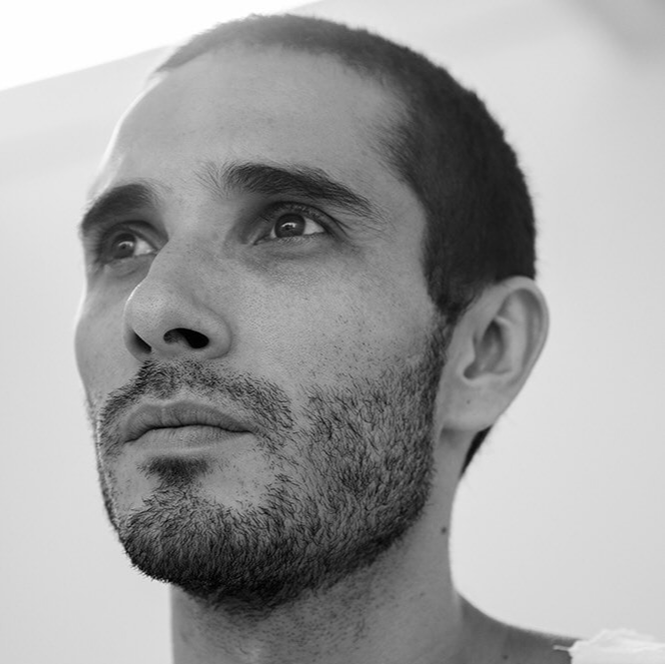 Daniel (Switzerland) discovered Iyengar Yoga in San Francisco in 2002 after his studies in psychology. Since then, he has practiced different styles of yoga and collaborates annually with different teachers in Ashtanga, Iyengar and Kundalini Yoga. In this journey the focus lays on inner growth, insights & realization. As spiritual beings we are always growing. The question is, when do you want to grow into your pure essence, which is always love - in the end. It´s not about competition. It´s about love and your inner timetable. Depending on your consciousness you can find for yourself the significance in self-love and unconditionally love or your soul-potentials, the feeling of coming home or peace & freedom. Whatever is right for you now. Whatever you´re open to. It´s always very individual. As we live in this special time a part of the journey is to heal/balance female and masculine energies within us. However it unfolds intuitively through us, you can dissolve obstructive patterns/contracts/promises ... or reintegrate separated parts of your soul. You never know before. With your regrown realization, wisdom and responsibility, your journey of blossoming of the heart will continue. The golden Key is always the connection to our heart - the gateway to the divine source and our soul. Your journey will be supported by high-sensitive medium Gosia Anna Sereda. Her main concern is to provide tools for self-empowerment, because every awakened heart leads to our ascent. This is her contribution and her intention/wish. The incomparable powerful sounds & vocals of Mitsch Kohn support & intense the inner process of heart opening as well as nourishing your lovely being. ​Olivia has a background in transpersonal psychology and Consciousness Studies and became known through her Youtube channel where she developed a new relaxation and empowering modality; Reconnective hypnosis - It is a combination of therapy and asmr molded into digital transformational art. She is also an overthinking coach, no BS meditation teacher, empowering workshop facilitator and freedom advocate. From a very young age Fadrique has been devoted to conscious entrepreneurship, as an agent of paradigmatic social change. In December 2002 Fadrique decided to leave his university studies in agronomy to fully embrace an austere and devotional life within the Orthodox branch of Rastafarianism called Boboshanti, in Jamaica. Thereafter, the thirst for service after awareness and social change has marked his life, this led him to study Eastern and Western philosophy in Nueva Acropolis school, where, in parallel, discovers the path of meditation and the practice of philosophical martial arts, Nei-Kung. In 2011 he decides to undertake an adventure with no money, wandering around the rural villages of Costa Rica for a year, with a donkey for companion. That same year he published his first book entitled "microdosis de desaprendizaaje". Fadrique is the founder of SIMPLE clean eatery & juice bar. His therapy is focused on transforming & healing male psyche through private transpersonal sessions. He also works with couples as a psychotherapist of conscious relationships and as a mediator of non violent communication. Shanti’s (Costa Rica) devotion to find the easiest and most inclusive forms of sharing the ways of happy living, together with his passion for humor, music and dance, has lead him to create the happiness activation technique, called “El Cortis”, a playful way to use the power of attention to awake and fuel from within, true happiness, in all it’s different forms. 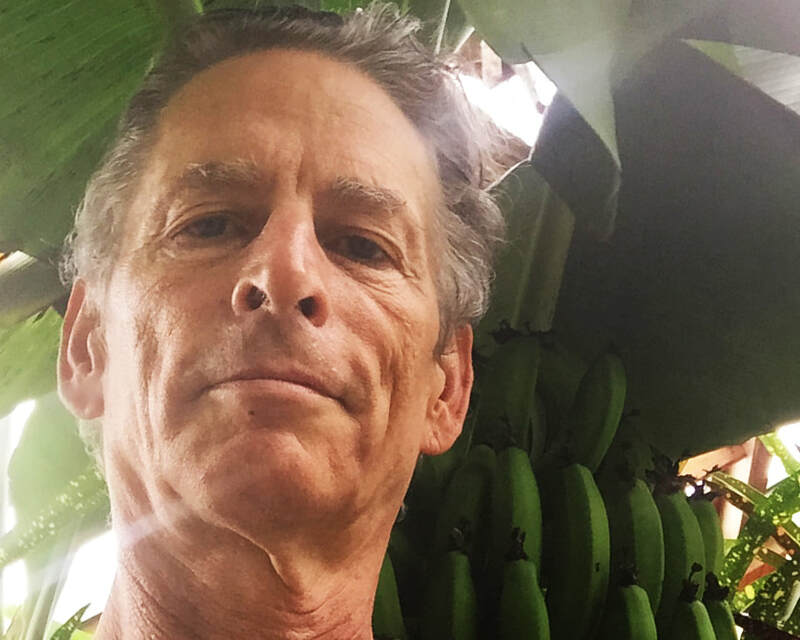 Mose (USA) spends much of his time in Guatemala where cacao ceremonies, kirtan, and ecstatic dance have had a major influence on his productions and DJ style. It is here on Lake Atitlan that he founded the weekly SunSet Cacao Dances where members of the community have the opportunity to journey deep into dance in a container of deep intention free of alcohol. Having been nomadic since 2011, he has developed a sound all his own through interaction with cultures from around the world. He finds a way to fuse the organic elements of tribal traditions with modern production techniques in order to create an entrancing journey for both relaxed listeners and those eager to move their bodies. DJ Journey Weaver (USA) creates sets fueled by luscious melodies and brainwave beats to drop you into the rhythms of your soul and move your body in sweet delight. Journey fell in love with the dance and exploring the world in the ever evolving adventure of life. Inspired by a love of dance and connection, Journey moves your spirit and form through space with the push of beats and the invitation of melody. From organic world beats to ambient chill, deep house to global base... each set is nourishingly familiar yet cravingly unique. Jaime Fleres (USA) is an author, writing coach, intuitive healer, and yoga and Qoya teacher. She revels in embodied practices that point us back to our own inner wisdom and support our authentic creative expression. She has taught workshops throughout the US and the world. Jaime has an eclectic background ranging from college professor to flower essence bodywork practitioner. A long-time student of natural healing, embodied movement, and expressive arts, she is trained in herbalism and flower essences, and is certified to teach yoga (including Restorative Yoga) and Qoya (an embodied movement practice infused with shamanic principles). She holds an MA in Writing and teaches others how to find and express their voices, their stories and their ideas. Qoya is an embodied movement practice based on the idea that through movement, we remember. We remember our essence is Wise, Wild and Free. These three principles reference the kinds of movement we explore in every qoya class: Wise, drawing on the wisdom of yoga; Wild, the creative expression in free dance; and Free, the freedom to experience pleasure and actually enjoy being in our bodies through sensual movement. There are no levels or experience required for a qoya class, and there is no way you can do it wrong. Qoya is not about how it looks but how it feels.